In November, prepays moved slightly higher over October levels, recording the third consecutive month below 8%. However, this month’s reading does represent the 7th month in a row of 7% or higher prepays. While the movement up was similar in percentage terms to October, the makeup was significantly different. This month, we saw, for the first time since we have been keeping records in 1999, the default CPR fell below 1%. At the same time, the voluntary CPR rose to the second highest reading since October, 2008. As we move into 2014, defaults and voluntary prepayments continue to diverge and this month is yet more evidence that we are in a period of alltime low default rates combined with rising voluntary prepayments. As for the detail, overall prepayments rose 1.76% to 7.23% from 7.11% in October. In comparing prepayment speeds for the first ten months of 2013 to the same period in 2012, we see that this year is now running 29% ahead of last year, with YTD CPRs at 7.16% versus 5.54%. As for the largest sector of the market, 20+ years to maturity, prepayment speeds rose by 16% to 7.80% from 6.71%. Turning to the CPR breakdown, the default CPR fell by 58% to 0.70% from 1.68%. As mentioned earlier, this level is the lowest since September, 1999 when our records began. Regarding voluntary prepayments, they breached the 6% barrier for the second time this year, coming in at 6.53% versus 5.43% in October. Preliminary data for next month suggests that voluntary prepayments will move back below 6% and defaults will rise slightly, but still well below 2%. Turning to the default/voluntary prepayment breakdown, the Voluntary Prepay CPR (green line) rose to 6.53% from 5.43%, a 20% increase. 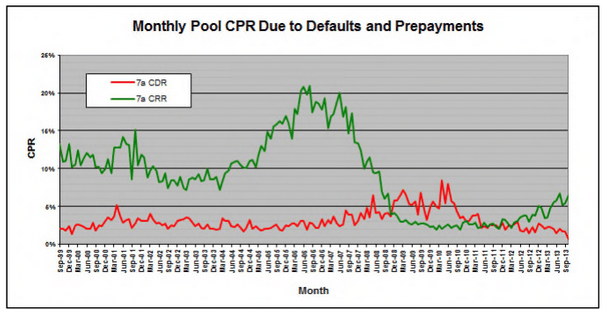 While the VCPR rose above 6%, the Default CPR (red line) decreased by 58% to 0.70% from 1.68% the previous month. Prepayment speeds rose in three out of six maturity categories. Increases were seen, by order of magnitude, in the <8 year sector (+21% to CPR 8.95%), 20+ (+16% to CPR 7.80%) and 8-10 (+2% to CPR 6.39%). Decreases were seen, also by order of magnitude, in the 13-16 year sector (-49% to CPR 3.98%), 16-20 (-25% to CPR 4.84%) and 10-13 (-22% to CPR 6.53%). This month reinforces our belief that defaults are at alltime lows and voluntary prepayments continue to rise from the ashes.